Click on the Calendar for public skating times. Military, CHA, & CFSA yearly discount is $50 off yearly rate. * Columbus Ice Rink scheduled Stick Time & Freestyle is included in the Season Pass Rate. 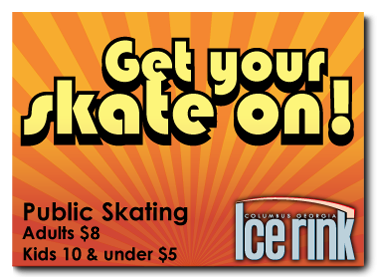 ** Ice Rink Season Pass does not include admission to public skate during the Greater Columbus Fair. Discount rates are available for groups of 25 or more with one week notice required. Contact us for more information.